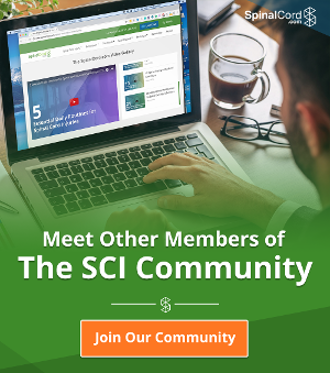 Cervical spinal cord injuries are the most severe of all spinal cord injuries. They most often lead to complete paralysis or fatality. The cervical spine is located at the very top of the spinal column. The seven vertebral levels within this region, which are classified as C1-C7 from the top down, form the human neck. There is an additional cervical-level injury known as a C8 injury which relates to damage to the spinal cord root that exits the spinal column between vertebrae C7 and T1. The spinal cord running through the cervical region of the spine is identified by the level of the vertebra in which it’s contained. Cervical spinal cord injuries are the most severe of all spinal cord injuries and may affect one or both sides of the body. The C1 vertebra, also known as Atlas, along with the C2 vertebra, also known as Axis, are the first two segments in the cervical spine. These levels are especially important, as they support the head. The Atlas vertebra pivots on the Axis vertebra which allows the head to rotate. Injuries to the spinal cord at the C1 & C2 vertebral levels are considered to be the most severe of all spinal cord injuries as they can lead to full paralysis but are most often fatal. The injury may be categorized as complete or incomplete depending upon its severity. The C3, C4, and C5 vertebrae form the midsection of the cervical spine, near the base of the neck. Injuries to the nerves and tissue relating to the cervical region are the most severe of all spinal cord injuries because the higher up in the spine an injury occurs, the more damage that is caused to the central nervous system. Depending on the how severe the damage to the spinal cord is, the injury may be noted as complete or incomplete. The C6 and C7 vertebrae are the lowest levels of the cervical spine, near the base of the neck. Injuries to the spinal cord corresponding to these regions of the spine have the potential to impact everything below the top of the ribcage resulting in quadriplegia. Though they often have better outcomes than higher cervical injuries, they are still considered incredibly severe because more damage is caused to the central nervous system the higher up in the spine the injury occurs. As is the case with any spinal cord injury, the damage is characterized as complete or incomplete depending on the severity. 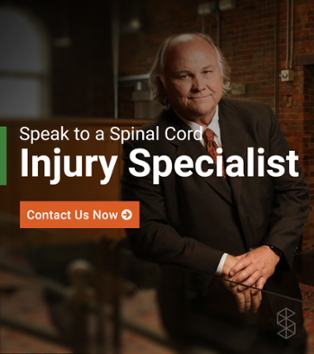 Our spinal cord and brain injury lawyers are standing by to explore your case and help you determine the extent to which you can receive relief from your financial burden. Every moment you wait could bring you one step further away from resolving your situation once and for all. 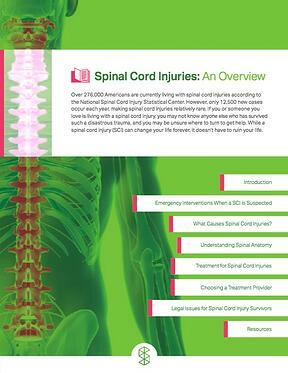 A spinal cord injury is the result of damage to any portion of the spinal cord or the nerves at the base of the spine. The spinal cord is a bundle of nerve fibers and tissue which lies within spine forming the brain’s connection to the body. Damage to any part of the spinal cord can impact sensory, motor, and reflex capabilities if the brain is unable to send information past the location of the injury. The higher the injury occurs, the more severe the damage. The level of completeness can also impact severity though no two people have the same prognosis for a spinal cord injury. The higher up in the spine that the injury occurs, the more severe the potential outcome. Some cervical spinal cord injuries are severe enough to result in death. Injuries to C1 and C2 are very rare and most injuries to the cervical spinal column occur near the C4 / C5 levels. While no two spinal cord injuries are the same, early treatment is critical to the long-term prognosis of any injury to the cervical spinal column. The C1 and C2 vertebrae form the top of the spine (neck) at the base of the skull. These bones are named atlas and axis respectively and support the pivot motion of the neck. Injuries to the spinal cord at the C1 & C2 levels are rare, extremely severe, and most often fatal. Atlas and axis are followed by C3 and C4 to form the high cervical vertebrae. If not fatal, complete damage to the spinal cord or nerves corresponding to any of the high-cervical vertebral levels most often results in full paralysis, or quadriplegia. A survivor may not be able to breathe on their own and will likely require 24-hour care for the rest of their life. An individual with an injury to the cervical spinal cord at the C5 level or below has a greater chance of retaining some motor and sensory function than a patient who experiences an injury to the C1-C4 levels. Though damage to the spinal cord at any portion of the neck has the potential to result in full paralysis of each of the four limbs, survivors of C5-C8 injuries may be able to breathe on their own and speak normally. Learn more about spinal cord injuries by downloading our free eBook, The Simplified Guide to Spinal Cord Injuries. The unfortunate truth of spinal cord injuries is that there is no way to reverse damage to the spinal cord at any level. With cervical spinal cord injuries being the most severe of all spinal cord injuries, patients will have a long road to rehabilitation ahead of them. Stabilizing and securing the neck to prevent further damage. Regulation of breathing and respiratory function. Prevention of complications including blood clots and stool or urine retention. Surgery to reduce pressure on the spinal cord. Steroid injections and pain regimens to reduce any discomfort and inflammation from the injury. Physical therapy to aid in regaining function of the affected parts of the body and to maintain the function in areas which were not affected by the injury. Stem cell injections are a new tool to aid in the recovery of the spinal cord. The use of stem cells has not been widely adopted, however, promising clinical data has been reported. A patient with a cervical spinal cord injury will need a lot of assistance in dealing with the injury and what it means for their future. Mental health is of the utmost importance to a patient with a cervical spinal cord injury as mental health directly relates to physical health. These patients will have a range of emotional changes along with the physical changes; so keeping up with mental health is a must. Seeking out a therapist who deals with paralyzed patients may be a huge part of recovery.